Members of the British Royal family attended the annual interfaith Commonwealth Day service today at Westminster Abbey. Queen Elizabeth led her family in a new hat with crown overlaid in the same oxblood wool silk crepe as her coat and a straw brim. The square crown and upturned brim with gentle upsweep on one side is a familiar shape on Her Majesty and the colour scheme, while dark, is uplifted with the silk cherry blossom and feather trim which links to the Queen’s silk printed dress. The ensemble’s success is thanks to a few factors: the scale suits Queen Elizabeth so well and the coat’s v-neck allows the light print of the dress into easy view, tying beautifully with the cherry blossom trim on the hat. Angela Kelly millinery designs often show a heavy hand applied to trimming, something that works here to lift and liven the dark hued design. I also love the use of velvet on the coat lapel, a small touch that gives textural contrast against the hat, allowing it to stand more on its own. The rest of the family followed in a consistent palate of navy, cream and blue (something that can’t have been a coincidence). The Duchess of Cornwall topped her beautiful navy and cream embellished coat with her much worn scream straw hat with upswept brim, wide navy folded straw hatband and knotted silk side detail. When she debuted this coat last fall, Camilla wore it with a new, more angular cream straw hat; while today’s hat has been repeated many times, I prefer it’s gentler, rounder lines with this coat. A side note to Camilla’s dresser: PLEASE steam the collar on this coat. The Duchess of Cambridge repeated her classically shaped navy rabbit fur felt hat with wide mushroom brim and tapered, square crown simply trimmed in a wide Petersham ribbon hatband and neatly folded bow at the back. I suspect some of you will notice that the hat is a slightly different shade of navy than Kate’s Beulah London coat and dress- something that bothered me until a closer look convinced me that the hatband matches the coat and dress quite well. While I might have preferred some colour contrast on the hat, the all blue ensemble works. Meghan Markle attended this event for the first time, debuting her second royal working hat. A simple beret in cream felt, the hat is trimmed only with a classic beret ‘stem’ on top. It’s not the most exciting of designs but an excellent choice for an almost-but-not-quite member of the family I suspect is trying not to claim any more media spotlight. The hat looks great on Meghan- the scale is wonderful and she carries the colour so well. And the placement! The beret’s perch, placed perfectly over Meghan’s right eyebrow, is SO GOOD. That is exactly how a percher hat is supposed to be worn. The Countess of Wessex repeated her navy moulded percher hat with swirling cream and gold feather trim. I need to repeat myself for this hat- great scale, great colour, great placement. This hat has become a workhorse for Sophie and no wonder- it’s a great piece on her. Princess Anne repeated a picture hat with navy straw crown and cream straw brim edged in navy piping and trimmed in navy feathers, straw bow loops and long curved quills. Anne, who often wears smaller brims, carries the larger scale design well and this piece does well to substantially update this decades old coat. The Duchess of Gloucester repeated a hat we’ve not had a chance to review yet here on Royal Hats. In pale, ice blue, the design features a squared felt crown and straw upturned brim with upsweep one side. The brim is bound in a stripe of felt and the hat is trimmed with a triple layered silk hatband and spray of blue and taupe striped feathers at the side. It’s difficult to assess the hat without a good front view (a small photo at its first outing can be seen here) but I think it has good potential. 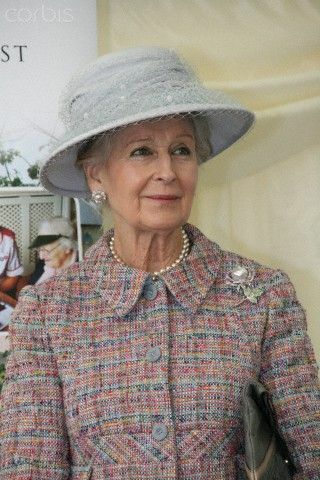 Princess Alexandra repeated her ice blue straw hat with tall crown, ruched silk hatband and net tulle overlay. The classically shaped hat has an Edwardian feel that suits Alexandra so well. The Commonwealth Day service, which is reportedly one of Queen Elizabeth’s favourite events, always brings us a parade of British royal hats and this year is no exception. Which hats here stand out most to you? This entry was posted in Great Britain and tagged Countess of Wessex, Duchess of Cambridge, Duchess of Cornwall, Duchess of Gloucester, Duchess of Sussex, Princess Alexandra of Kent, Princess Anne, Queen Elizabeth. Bookmark the permalink. Well Done, ladies all! This is really how one can color coordinate a group for an important event without it looking overly contrived or heavy handed. HM is in fine form, and the small touch of the black gloves really make everything pop. While MrFitzroy is generally not a fan of frontal floral hat trims, this time it works beautifully, as has been noted, by picking up the visible print of the dress, and also with the exceptional (and rarely seen) brooch –a historically appropriate choice, and a treat to see worn again. Also, interesting the way the coordinated colorways sort out….Navy for both D of C’s (Cornwall and Cambridge) and The Countess, Cream for The Princess Royal and the soon to be Duchess of ?? ?, and the light blues for Princess Alexandra and D of G. Did that just happen on it’s own, one wonders? It would seem a bit much that each were assigned specific colorways. So the progression was likely a happy accident….or not. And an extra three cheers for Princess Anne….anyone who can rock a thirty eight year old coat at a major royal event without looking like a refugee from the dustbin certainly gets a couple extra gold stars! I like the Queen’s hat very much, the trim is abundant but looks good and not messy. Thinking about the overall outfit, I realise that the V-neck of the coat makes a huge difference in my opinion – I think it’s a style that really flatters the Queen, more than coats with higher collars. Although I liked the hat that Kate wore with this coat last time, I think this larger hat actually balances her current silhouette better. There aren’t any hats that I don’t like. Meghan’s is very simple, but worn perfectly, and suits a not-quite royal. Overall I thought her outfit was very well judged. I really like all the hats and HM’s ensemble is particularly successful. Wow, I love this whole look for HM! The color is fabulous, especially as it’s one we don’t often see on her, and the cherry blossom trim was an excellent choice (I also say that in anticipation of the cherry blossoms blooming hopefully at the end of the month here in D.C.!). I agree with you HatQueen about the collar, and that silver brooch is a stunning addition to the whole ensemble. My only complaint is I wish the crown wasn’t so flat/squared off, but this is a minor, minor detail. This is still one of Camilla’s good hats, but I will forever mourn the loss of feathers. The combination with this coat was a great choice, although I agree that collar could use some steaming. As navies, like greys, are difficult to match, I don’t mind the slight differences in shades between the hat and Kate’s outfit. What I do think could be improved would be her hairstyle; usually I’m the last one to complain about her hair being down, but I think with the lampshade shape of the brim, her hairstyle from the first outing would’ve been a better choice. Meghan is 2 for 2 in terms of royal hat success! She continues her understated and monochromatic approach, but it works well for her so far. Sleek and sophisticated, she knows how to wear a hat well (and I completely agree the angle and placement of the perch is practically perfect!). I only hope that this doesn’t remain her style fully, as I would like to see something with some crazy trim or angle at some point (Ascot anyone?). Still a good hat for Sophie, but I would like to see it with her hair down for once; her hairstyle here does nothing to enhance her look. Also, this is probably my least favorite outfit so far for this hat. I still love this hat for Anne, and it pairs so nicely with the coat, but I wish they would update the buttons and open the collar a bit at the top to make it look less dated and stuffy. I had not previously seen this hat on Birgitte, and the photo I had seen previously from the front had Sophie blocking the feather detail. Birgitte’s never been one for super-dramatic hats, but this is definitely a great one she should wear more often (just not TOO often haha). Nothing surprising from Alexandra, but certainly a great look overall. I especially like how the colors start lighter at the top and slowly fade to darker shades as you reach her shoes. The queen wore diamonds and rubies, not silver. All the ladies look great with nice hats and appropriate for a tricky season of late winter/early spring. I especially like Princess Anne’s hat – it’s quite celebratory, as is the Queen’s. I agree that Meghan’s outfit was perfect. The rest don’t impress as much probably just because they are repeats as they are lovely too. Her Majesty is looking fabulous in her new hat. Great outfit too. Mcncln: I agree with you 100%. HM’s beautiful burgundy/maroon/cranberry color would also have been perfect on Christmas, even though I really like the orange ensemble. Her coat is very nice, especially with the velvet collar. The styles and textures of today’s hats were all across the board – old, new, wool, straw, cocktail, large brim, etc. Where was the fashion police? I love the hats especially Sophie’s but her hair is a mess. Dear Sophie, I’m a retired hairdresser and am available if you need me… signed “Hair Police”. Amazingly enough, I like *all* of these hats. Not often that happens! And Kate’s wearing a brooch. Skippy claps!! The Duchess of Gloucester deserves credit for her mastery of understand elegance… she never stands out (probably by design) but always looks wonderful. I agree with you completely. I think her hat was the best of a good bunch!!!!! I think my favourite is the C of W’s, but while Princess Anne’s looks like an awful lot of hat, she carries it off well. There is a full facial picture of the Duchess of Gloucester at http://hrhcountessofwessex.blogspot.ca/ courtesy of the Westminster Abbey Instagram. Alas I’m not on board with Kate or Soohie’s Pairings today. Kate’s hat is too heavy for that beautiful coat (I had a hunch she’d wear it, but the previous hat was much better.) And Sophie has the opposite problem. Swap hats and I think it might work. I like all of the pieces you see, just not together. I love HM’s burgundy, not a usual colour for her, and a twin of the Christmas orange. I like Camilla’s pairing a lot, and then there’s Anne. Well if you can make that 1980 coat look current, you go! Meghan is my best dressed. She’s so well styled for these formal occasions, very understated but very luxe. She looked fabulous. I think you might have articulated the essence of Meghan’s style- understated luxe. Her hats so far (2 and counting!) have been exactly this and it will be fascinating to see if she continues on this vein.